Like a lot of runners, I read the book ‘Born to Run’ a couple of years ago. It fascinated me, but I didn’t know enough about form to think about it in much detail. I more enjoyed the adventure that ensued in the Mexican Copper Canyons than the barefoot running sentiments and that was another reason that drew me into ultrarunning. However, soon after I did jump on the bandwagon and bought some of the most minimalist running shoes on the market, the New Balance MT00’s, which are essentially just a sole and a scrap of fabric with laces to keep the sole in place. The reason was not the book or the trend, but the fact I had been suffering with terrible shin splints whilst training for the London marathon, to the point that even when my toddler climbed up and touched my shin I would wince, and minimalist shoes were supposed to help by forcing a more natural stride. So I bought these shoes to correct my form from heel striking to forefoot striking, which is the most natural. It worked and my shin splints went away in no time at all. However, the MT00’s were so minimal that anything over a 10k or half marathon distance became very hard work. In the end I used them as a balance for form in shorter training runs, mixed with a more typical road shoe for longer distance runs with the benefit of an inherently improved stride. The biggest downside with the MT00’s is their sole. This consists of lots of small circles of rubber, but between them debris such as stones can get through resulting in me swearing my head off mid-run and looking like I’d stepped on a live wire, more times than I can remember. As my distances have become longer and I have moved much more into trail running, I have adapted and used shoes that are light, but protective and encourage a forefoot strike whilst giving enough comfort to go the distance. My two favourites for this summer were the Pearl Izumi Trail N1 and the Salomon Sense Ultra. They are not minimalist per say, but encourage a forefoot strike whilst remaining very comfortable and protective for runs up to five hours in training or 10 hours on race day. One of my key goals for 2014 is to improve my speed. I know I can run well at the marathon and 50 mile distance now, but I want to move up the field and with the added confidence of several 50 mile finishes under my belt, I want to get faster. To do this, I need to go back to road running in the winter for my shorter runs and continue my trail running for my longer weekend explores. Having done a lot of research on a training shoe that would suit me for this, I came across the Merrell Road Glove 2. The shoe is currently on sale and can be bought for £68 currently (£90 RRP). This is a zero drop shoe, which promotes a forefoot strike and has just under 11mm of rubber between your foot and the road. It has a Vibram outsole which is designed for road running and offers excellent grip- as well as no gaps for stones to poke through and cause havoc. 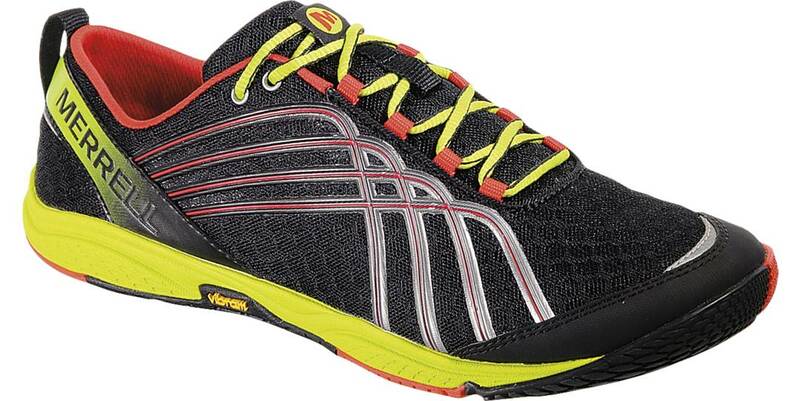 It is purely a road shoe and I have felt it slipping when I have taken a detour through a field. The upper is thin and light, but not as thin as the MT00. I have worn it to date with thin road socks but also thicker trail socks and the lacing system is easy to adapt so it fits very closely and is barely noticeable. I haven’t had one blister as the mesh and synthetic leather upper bends very easily and as the name suggests, moulds to you like a glove. The final point on this shoe is the toe box. This is much wider than I am used to and really does make a lot of difference for comfort. I don’t have the widest feet in the world, but compared with other shoes I have worn and with road running have a greater impact on the feet and legs than trail running, this was a welcome benefit. Whilst the barefoot trend is on the wane, I don’t think of this as a barefoot shoe. It is a shoe that is incredibly light, improves form (for those like me that regress to heel striking easily) and is very comfortable all round. The sole offers plenty of protection even with minimal padding and whilst I have put less than 100 miles on these, it seems very robust for such a light shoe. As I have mentioned, it is not suitable for trail running and does take in water very easily. On the flip side it drains very fast and is highly breathable. I would wear this for a road marathon for sure, but more importantly I think it really will help me improve speed over winter. With its breathability, it would also be an excellent summer shoe and could be worn without socks. The only downside is, I don’t really have any excuses now to not incorporate interval training into the plan over the next few months….but that will hopefully pay dividends next spring and summer.